$279. Whack A Mole. The Whack a Mole has become an internet sensation over the last few months. 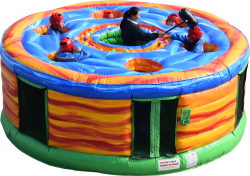 This interactive inflatable is sure to be the hit of your party or event. 7 participants at a time can enjoy this game where the center person attempts to "whack" the moles who are attempting to steel the balls from the center ring and duck back into cover.